Join the discussion on our forums! Come discuss Witch's Apprentice over in our dedicated Witch's Apprentice discussion topic. Battlecry: Add a random Shaman spell to your hand. Is she a frog that became a witch, or a witch that became a frog? You guys do realize...this card is Yogg after being hexed and removed from Standard? Shaman's spells are very bad, situational and tempo loss. This minion is also tempo loss, hero power minion are strictly better. Shaman spells are actually pretty good overall. But yes this card is no babbling book and even that no longer sees much play. 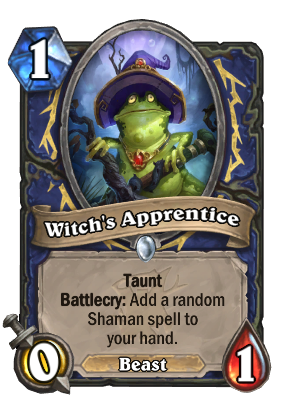 While shaman spells are better than most classes it's not as good as mage spells and especially on turn 1 a 1/1 is MUCH better than a 0/1 taunt. i dont know maybe play this on turn one and Flametongue Totem on turn 2 and get a spell... this card is kind of meh. Babbling Book is that you? I hope this gets a Pavel reference in the flavor text. This girl (?) is cute. Exodia shaman? Sounds bad, but probably still going to be better than freeze. Maybe Hagatha + Freeze Sham ? I'm not gonna lie this looks pretty bad. it's basicaly a babbling book except shaman spells are not that good and I'd rather it had an attack point than taunt... Beast tag could make a funny menagerie deck with a few murlocs and totems. Seems thats what blizz is going for here. It's designed to mimic and synergy with Bewitch, but may be good in other decks as well depending on other new cards. Nice art Btw! A really good Cryostasis target!